Date: Imprinted at London by R[ichard] F[ield], for John Harison, 1596. The fourth edition of Shakespeare's popular narrative poem Venus and Adonis was published in 1596, three years after the first edition. This fourth edition was the last to be printed by Richard Field and sold by John Harrison. Unlike the three previous editions, this edition specifically mentions Harrison by name on the imprint, whereas the first three editions said only that the book could be purchased "at the signe of the white Greyhound in Paules Church-yard." However, in 1596, Harrison moved to another shop, also called the White Greyhound, near his original shop. Therefore the revised imprint shown here might have served to minimize confusion about where to purchase the book. 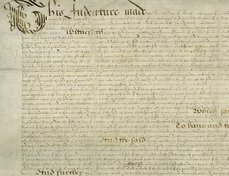 Harrison assigned his right to copy Venus and Adonis to William Leake on June 25, 1596 "in full Court." Like the third edition, the fourth edition is imposed as an octavo rather than as a quarto, and because it was set in smaller type, it still comprises 27 leaves. It may have been intended to be bound with other short poetic pamphlets, and all of the subsequent early editions are also octavos. 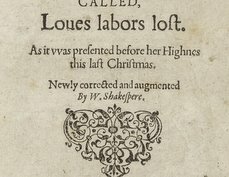 Although Shakespeare is now known primarily as a playwright, in his own time he was equally revered as the author of Venus and Adonis, first printed in 1593, and Lucrece, his two sensationally successful Ovidian narrative poems. 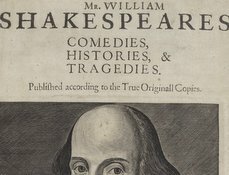 Venus and Adonis appeared in more printed editions than any other work of vernacular poetry in his lifetime, and was published twice as many times as his most successful play, Henry IV Part 1. This copy was purchased by the British Museum in 1864 for £336 and, along with the museum's other books, became part of the British Library's collections under the 1972 British Library Act. It is one of two copies known to survive; the second copy is part of the Bodleian Library collections. 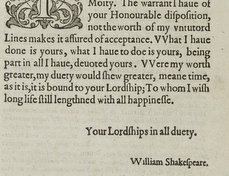 To learn more about the plot and early printing history of Venus and Adonis, please visit the Folger's Shakespeare's Works; to read a modernized edition of the poem, see Folger Digital Texts. Peter W.M. Blayney, The Bookshops in Paul's Cross Churchyard (London: Bibliographical Society, 1990). Jeffrey Todd Knight, Bound to Read: Compilations, Collections, and the Making of Renaissance Literature (Philadelphia: University of Pennsylvania Press, 2013). Sidney Lee, ed., Shakespeares Venus and Adonis: Being a Reproduction in Facsimilie of the First Edition (Oxford: Clarendon Press, 1905). Marta Straznicky, ed., Shakespeare's Stationers: Studies in Cultural Bibliography (Philadelphia: University of Pennsylvania Press, 2012).